When I saw this skirt I knew I had to have it. I had been looking for something with red lips for awhile and I loved that this was embroidered netting over a cotton skirt. 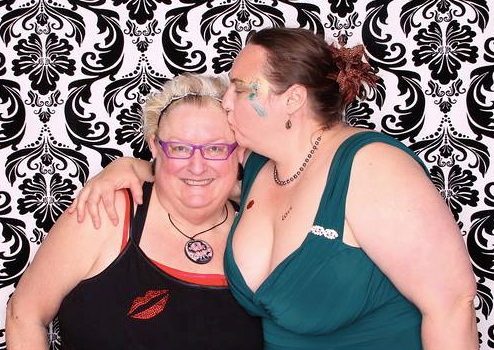 My friend Claire giving me a kiss at the Party, to go with the one on my Cami, and isn’t Claire’s dress fabulous? I got an opportunity to wear it when my friends threw a fabulous party for a very special friend’s birthday . It was a wonderful night. The party was at a venue I had been dying to go to, The Battery, and since the Birthday Girl was a Burning Man campmate, we got to see various iterations of different years of campmates from many different years of Burning Man. A glorious evening. That is a kiss on MonkeyBoy’s face, I had kisses on my skirt and top so I handed out sticker kisses. Such a fun evening. Thanks to my friends for creating this moment. 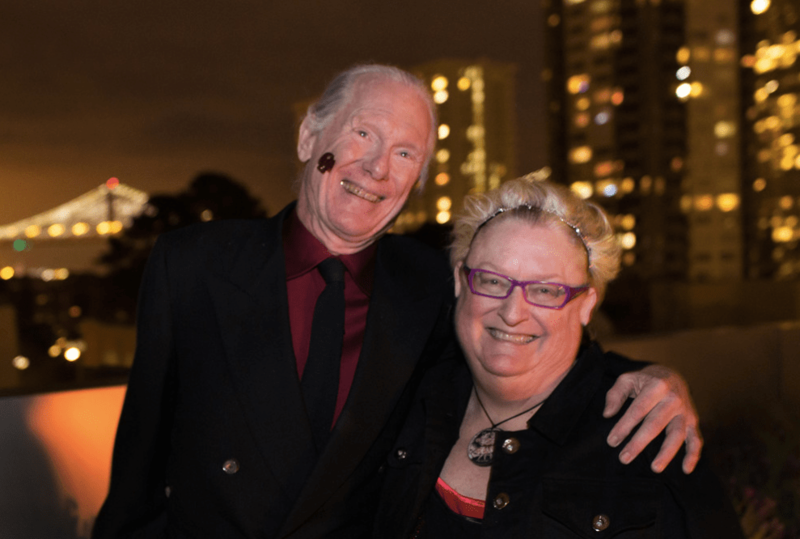 And we had a chance to have our photo taken in front of the Bay Lights by the fabulous John Curley. The evening was everything I could have wanted. 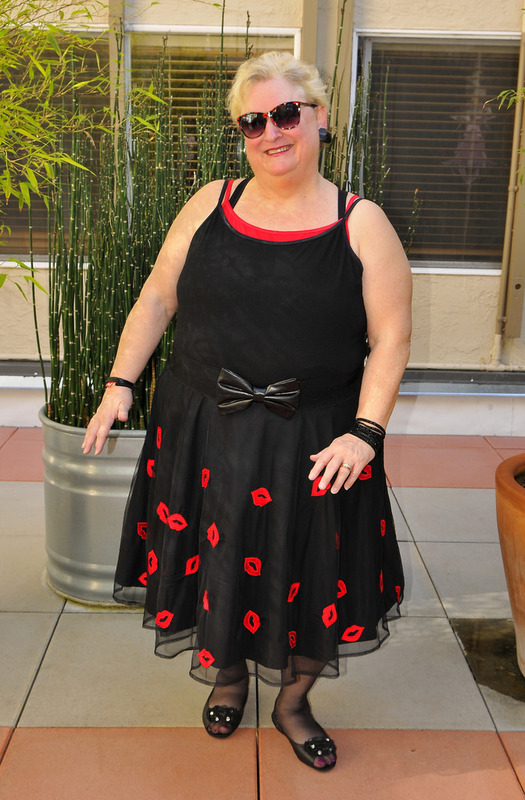 This entry was posted in Avenue, Plus Size Clothing Reviews, Plus size DIY Size 28 and tagged affinity mingle plus size blog, plus size 28, Plus size eShakti by affatshionista. Bookmark the permalink. You are FABULOUS! That is all. That is so kind of you to say, thank you. This looks like it was a blast! I love the boldness you have with your looks – very glam. Thanks, that is very kind of you. 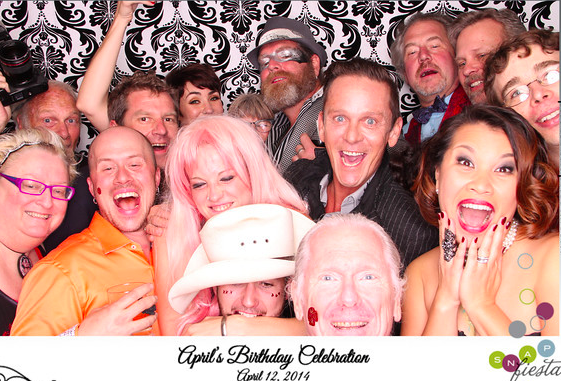 It was a fabulous party. That was a fun night, and you and Monkeyboy looked fabulous! It was. It is great to have such amazing friends, and you of course always look fabulous! Thanks for commenting.